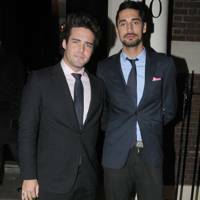 Hugo Taylor is an entertainment PR who is best known for appearing on the reality soap Made In Chelsea. He went to private school Harrow, and is, so we've read, "the Chelsea crowd's go-to man for the coolest places to *see and be seen*" in. He claims to never have scored lower than an A in any exam he has ever taken. His dad is a QC and owns a house in Dubai that Hugo regularly frequents for a spot of sunshine. He also loves heading to Norfolk, Florence, St Barts and Cannes. Hugo is best friends with broker Spencer Matthews, and supports Arsenal Football Club. He dated make-up artist Millie Mackintosh (whose family is behind Quality Street chocolates) on the show. However, the pair split in October 2011 after discovering that they had both been unfaithful to each other. If you’ve been wondering during quieter moments, whatever happened to Made In Chelsea’s Caggie Dunlop, wonder no more.